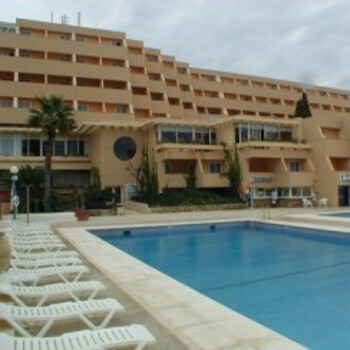 Great location - very different from your average holiday hotel - Very Spanish !!! The only critisism is that they should get rid of the Diving School and replace it with a bar, with seats, tabels & parasols. Great location situated within the upmarket marina area with marina bars and restaurants close by. Fantastic views of Marina and Harbour, Ibiza Town and D'alt Vila. Talamanca Beach is about five minutes walk away. It is fun taking the 10 minute water taxi ride over to Ibiza town, the fares are quite cheap but they can add up. Hotel breakfast very good quality food - eggs & omelettes made to order. Public areas and swimming pool look good and are clean. Although swimming pool set within concrete and glass area with little shade and gets very hot. Nice views when you submerge from pool though. Regretfully downside is bedrooms. From personal point - our room was tired, dirty, with a shower that was no more than a dribble. On plus side, our room was large with good air-conditioning and great view. If they could get rooms and pool area sorted it would be a very good hotel in a great location. The hotel is not like your normal package holiday hotel. The views are spectacular overlooking Ibiza Town & the marina. There are very few children here. Nothing for them and probably the price is prohibitive. The main drawback is the pool area - where it once was surrounded by the sea - it is now surrounded by road & car park because of the new habour development. Also there is no pool bar - Unbelievable For a 4 star hotel! The pool beds are solid plastic and very uncomforable.